PHOTO: French actress Catherine Deneuve christened the new Uniworld river ship that bears her name. All photos by James Shillinglaw. 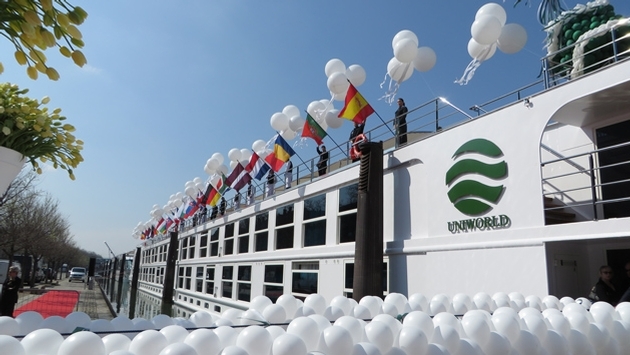 On a sunny but cool day in Lyon, France, Uniworld Boutique River Cruises turned to famed French actress Catherine Deneuve to christen its new S.S. Catherine, a sumptuous new entry into the European river cruise market. Ms. Deneuve gave a short speech on March 27 touting the benefits the new ship will bring to French tourism and then cut a ribbon that released a champagne bottle into the S.S. Catherine’s hull. Four of the ship’s butlers then simultaneously cut off the tops of champagne bottles to further christen the ship. Deneuve returned with the new ship’s captain to bless the vessel with more champagne. Earlier in the ceremony, Beatrice Tollman, wife of Stanley Tollman, founder and chairman of The Travel Corporation, Uniworld’s parent, looked back at the history of her family’s company, which began 60 years ago in Johannesburg, South Africa, with one small hotel. They grew their hotel empire by developing the Colony hotel and restaurant, a famed gathering spot for celebrities in South Africa, and then built the five-star The Towers in Johannesburg. Eventually, the Tollmans built an empire of boutique hotels in South Africa and London, before branching out into the escorted tour business with such companies as Trafalgar, Insight, Contiki, Brendan and others. Ten years ago they purchased Uniworld and refocused the company on the upscale river cruise market. Indeed, the 159-passenger S.S. Catherine is clearly aimed at attracting a luxury clientele that appreciates very fine food and posh accommodations. The ship features French-inspired décor throughout its public rooms, staterooms and suites, as well as some unique features that reflect the unique tastes of the Tollman family. Like its sister ships S.S. Antoinette and River Beatrice, S.S. Catherine has an interior design by Beatrice Tollman, who is also president and founder of Uniworld’s sister company, The Red Carnation Hotel Collection; her daughter, Toni Tollman; and Brian Brennan, projects director for both Uniworld and Red Carnation. They have filled the ship with period French furniture, expensive drapes, curtains, bedspreads and wallpaper. There are more than 200 original pieces of artwork on the vessel, including works by Miro, Calder and other top artists. Some works, including the giant mural paintings in the Cezanne main dining room, are by relatively new South African artists known to the Tollman family. The ship’s main reception area and atrium features a Murano chandelier, a large bronze horse sculpture, a small waterfall and a glass elevator. There are 80 staterooms, five suites and one Royal Presidential Suite, all with English handmade beds and individual décor. Suites have balconies and other staterooms have automatic windows that open up to cabin to the river. S.S. Catherine also has Uniworld’s signature Bar du Leopard, complete with a built-in movie theater, and an adjacent small indoor pool with a large wall sculpture of leopards in the jungle. Similar Leopard bars are found in several Red Carnation Hotels as well as on the S.S. Antoinette. S.S. Catherine’s Van Gogh main lounge comes complete with a faux fireplace, antique furniture, large paintings by a South African artist, and a square marble-topped bar. The main Ce´zanne Restaurant serves multi-course gourmet cuisine sourced from local farmers’ markets. There’s also a bistro, coffee and tea bar, Serenity River Spa, and fitness center. It all adds up to an exquisite new ship that very much caters to a luxury customer base, but also aims to provide accommodations that are beautiful but comfortable. It also reflects the Tollman family’s focus on delivering great hospitality in an environment reflecting a strong sense of design and fashion. S.S. Catherine, currently based in Lyon, will sail on Uniworld’s “Burgundy and Provence” and “Grand France” itineraries. It is currently sailing on a brief inaugural cruise with members of the press and travel agency community onboard. For more photos of the new ship, click on S.S. Catherine Preview.